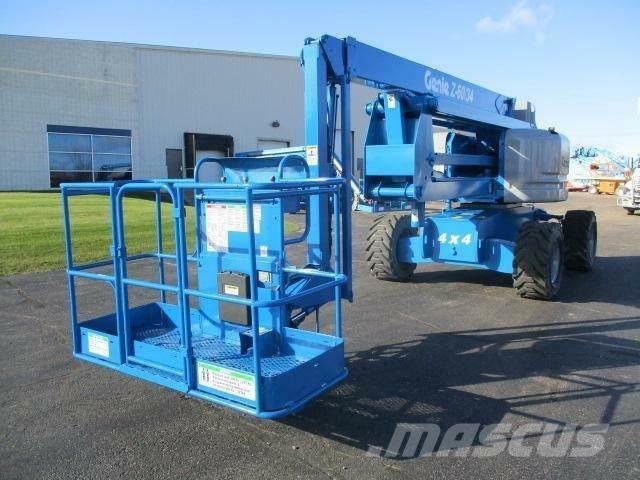 Overige informatie Description: This is a 2004 GENIE Z60/34 ARTICULATING BOOM LIFT. 4 x 4. FULLY SERVICED. GREAT ROUGH TERRAIN PNEUMATIC tires that work indoor and outdoor, 4 WHEEL DRIVE that allows you to travel through rough terrain areas. Unit includes 360 DEGREE continuous turn base. 72" WIDE BASKET. 500 LB lift capacity, Platform reach height is 60 feet..great for all your construction jobs with a 66' work height with a 34' horizontal outreach. Unit has a STRONG FORD DUAL-FUEL ENGINE. This is one of GENIE's most popular and hardest to find units. FRESH FACTORY PAINT, new decals, and fully serviced. Low hours well maintained truck. DEALERS would charge you $120,000 FOR THIS LIFT BRAND NEW. Call me with any questions at 716-568-4135 - available 7 days a week. Dimensions are: 7'11" WIDE, 8'8" HIGH, 26' LONG, 22,266 LBS WEIGHT. ONLY 4,163 HOURS. FINANCING AVAILABLE FOR ALL CREDIT TYPES, 100% TAX DEDUCTIBLE... Call us for more details!